Ben Simmons' combination of size and skill is rare. When his otherwordly teammate Joel Embiid leaves the floor, though, so do many of the advantages that make him great. Ben Simmons is a generational talent—the rare sort who demands that opponents deviate from their usual matchups, compromising entire rotations and game plans in the process. There are so few viable answers for a 6'10" point guard with the speed and grasp to dominate the position. And yet most every night, Simmons leads the Sixers headlong into some of their worst basketball. The fact that Philadelphia has yet to figure out how to win stretches without Joel Embiid on the court is hardly the fault of Simmons alone. His otherwise obvious stardom simply makes him the face of it. Functionally replacing a player like Embiid is impossible, given that no one in basketball is like him. One could make a reasonable case that his defensive impact is the most profound in the league. Veteran bigs commonly dupe themselves in his vicinity, rushing or faking their way out of their usual rhythms based on the twitch of Embiid's shadow. All the while, Embiid functions as a gigantic skill player, riding technique to a smooth 24 and 10. Even the best reserves can't come close to operating—much less producing—in any similar way. This is understood. It's a problem familiar to any team with a superstar, as part of the balance involved in relying on exceptional talents lies in regularly making do with the unexceptional. The Sixers are currently lost in that shuffle. Brett Brown has staggered his rotation to keep Simmons in the mix when Embiid sits and toggled between Amir Johnson, Richaun Holmes, and Dario Saric as backup centers. The most common result is implosion. Lineups featuring Simmons but not Embiid eat about nine points per 100 possessions on average, a devastating figure that unwinds much of Philadelphia's best work. It's then that Simmons hits the wall. Compare the situational effectiveness of various Sixers and you'll find that players like Saric, J.J. Redick, and Robert Covington perform pretty similarly both in these lineups and out. Their shooting percentages, in particular, go almost untouched. Not so for Simmons, whose 60.5% true shooting with Embiid on the floor craters to 46.6% when Embiid sits. That difference is a chasm— similar to the margin in efficiency between Chris Paul and Dion Waiters. That Simmons cannot—and in most cases, will not—shoot from range fortifies the roadblock. Simmons will beat his man off the dribble only to find secondary defenders ready and waiting to receive him deep in the paint, a test of the rookie's in-between game. Thus far it has looked incomplete; not only are shots from this range among the most difficult in basketball, but Simmons is attempting them while driving in from the perimeter at full speed. Under those circumstances, a floater sinks with a resounding thud. But Simmons is stuck. Drive too deep into the defense and it may swallow his attempt whole. Get too cute with a kickout pass and Simmons risks throwing the possession away. Simmons enjoys such a clear individual matchup advantage that his scoring game manifests in straight lines. Training more defenders to his every movement—as happens naturally when Embiid isn't around to distract them—adjusts the endpoint, bumping it further and further from the rim. Do the Lakers Have a LaVar, Lonzo or Luke Problem? This is how defenses are warping the shot chart of a player who might otherwise seem unguardable. 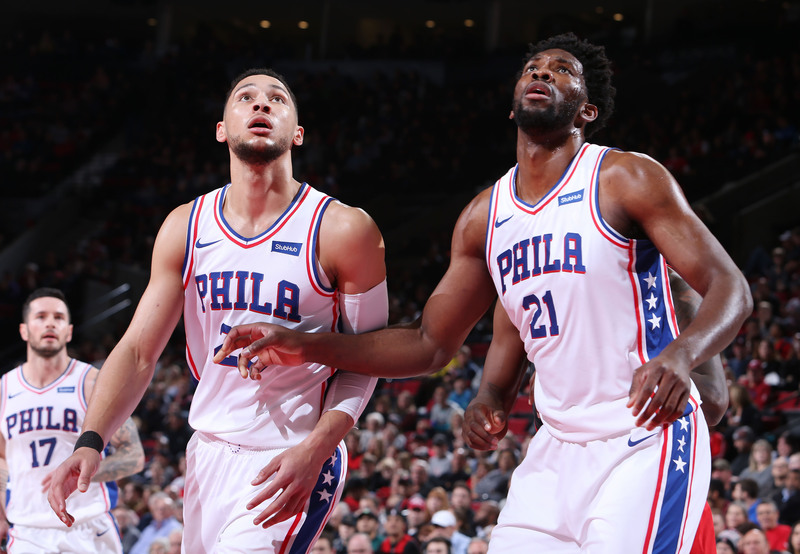 Embiid's presence alone is the difference between Simmons taking 59% of his shots in the restricted area and 45%, per NBA.com. Most of those lost shots wind up higher in the paint, where Simmons shoots just 35% overall. The rest wind up as reluctant mid-range jumpers. (Simmons has taken all of 14 shots outside the paint this season in the 649 minutes he's played with Embiid. In the 666 he's played without him, he's attempted 37.) To make matters worse, Simmons is converting far fewer of his shots from all ranges when flying solo—an effect most pronounced in the restricted area. Embiid affords Simmons options, which are especially helpful for a player whose range can be so limiting. On his own, for example, Simmons has to rely on spin moves to help create angles and space. Yet every time he turns his back to the defense, he invites pressure—the sort that could throw him off-balance. Even when he posts up smaller guards, defenses have every reason to collapse and smother any attempt to pass the ball out. It is not a coincidence that, without Embiid, Simmons effectively doubles his turnovers per minute. Simmons is hardly the first young player to have issues dealing with multiple defenders; if anything, he may be a year or two ahead of the narrative curve. Facing double teams is a rite of passage, reserved for those stars who break through to force an explicit, premeditated response. Simmons was born into the league at that level. Next comes the climb, be it over or around the problems he's thus far tried to crash straight through.